If you’ve been following us over the last weeks, you probably have heard about “AntwerPPen & More”. This brand new Conid exposition provides a unique glimpse behind the scenes, unveils our brand new Cavens Pen and shows our strong and essential connection to Antwerp. Situated in the heart of Antwerp in the SD Worx lobby, this exposition is open for visitors up until August 17th. We’ve been very excited about this exposition, and preceded by months of preparation and detailed planning, we finally could show the result to the public on July 21st. We opened the AntwerPPen & More with an exclusive vernissage, where we revealed the newest member to our collection: the Cavens Pen. Together with the Conid Team, over 200 visitors came to explore our pen collection, but also listened to three inspirational stories about how Antwerp, passion and innovation are inextricably linked. Some well-known faces, such as Pencilcaseblog, payed a visit too. Read about his experience of our AntwerPPen & More exposition on his blog. Next to displaying our pen collection, AntwerPPen & More aims to take a different approach to the traditional pen show. We do not offer to buy a Bulkfiller, or expose any other brands. This leaves more room to explore what is most important to us: our passion. 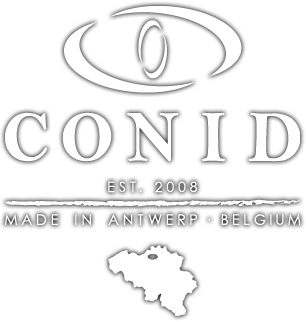 We would like to show the “More” behind Conid and our pens, but also behind Antwerp and our passion for the city. This eventually resulted into an interactive exposition, in which visitors can explore everything about Conid and our new Cavens Pen through sound, video and display. Through this exposition, we also aim to act as a bridge between the younger and older generations of pen enthousiasts, but also between a well-experienced community and new, unfamiliar faces. By spreading sparks of our passion for handwriting, craftsmanship and Antwerp among them, we want to follow the footsteps of Jozef Cavens: passing along a passion for the true essence of writing among the future generations. Want to explore the entire story behind Jozef Cavens and his pens? All information is found on the Cavens Pen webpage. Our AntwerPPen & More exposition is open freely for visitors on weekdays from 8.00 am to 7.00 pm up until August 17th in the lobby of SD Worx, Brouwersvliet 2, Antwerp. 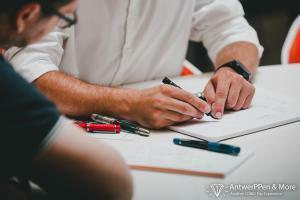 More info on https://www.conidpen.com/antwerppen-more-en/. We also like to share our first newspaper, a ‘special edition’ on the occasion of our AntwerPPen & More.